The Bhopal disaster or Bhopal gas tragedy was an industrial disaster that took place at a Union Carbide subsidiary pesticide plant in the city of Bhopal, India. On 3 December 1984, the plant released 42 tonnes of toxic methyl isocyanate (MIC) gas, exposing more than 500,000 people to toxic gases. The first official imm…ediate death toll was 2,259. A more probable figure is that 8,000 died within two weeks, and it is estimated that an additional 8,000 have since died from gas-related diseases. Crude Justice tells the story of damaged lives, but also of the fighting spirit and resilience of people who understand that what’s threatened is not just justice for the victims of the spill, but the integrity of the American judicial system itself. Visit http://crudejustice.org to watch the 18-minute video and for additional information. New Yorkers rally to shut down Indian Point, an old nuclear plant in an active seismic zone that puts 20 million Americans within a 50 mile radius at risk. In the United States, 1 in 3 Americans live within 50 miles of a nuclear plant and are threatened by a nuclear disaster. An ExxonMobil pipeline that runs under the Yellowstone River near Billings in south-central Montana ruptured and dumped up to 1,000 barrels of oil, fouling the riverbank and forcing water intakes downstream to be closed. Company spokeswoman Pam Malek said the pipe broke about 11:30 p.m. Friday and leaked for about a half-hour. The cause of the rupture in the pipe carrying crude oil from Belfry, Mont., to the company’s refinery in Billings wasn’t known. But Duane Winslow, disaster and emergency services coordinator for Yellowstone County, told NBC station KULR8 that erosion from high water this spring likely played a role. Brent Peters, the fire chief for the city of Laurel about 12 miles east of Billings, said the break in the 12-inch diameter pipe occurred about a mile south of Laurel. Crews shut down the pipeline about half an hour later. Peters said about 140 people were evacuated starting about 12:15 a.m. Saturday due to concerns about possible explosions and the overpowering fumes. All were allowed to return after instruments showed fumes had decreased. He said more evacuations occurred farther downstream outside his district. Gov. Brian Schweitzer and Sen. Max Baucus called for a swift cleanup. The company “deeply regrets this release and is working hard with local emergency authorities to mitigate the impacts of this release on the surrounding communities and to the environment,” the statement said. GELLERMAN: It’s Living on Earth, I’m Bruce Gellerman. 25 years ago – April 26, 1986, at precisely 1:23 in the morning, Ukraine time – the number four reactor at the Chernobyl nuclear power plant exploded. GELLERMAN: A faded mural on a vacant apartment building welcomes us to Pripyat. The town was once home to 45,000 residents – plant workers and their families. The sign reads: “The Party of Lenin Leads Us to a Communist Victory.” My guide Alexander Shevchenko deadpans an old party slogan: the people of Pripyat really did invite the friendly Atom into their homes. He laughs alone in the silence. GELLERMAN: But for our Geiger counter, the apartments are ghostly quiet. Plant officials delayed the evacuation of Pripyat for a day and a half. By then, Alexander says, the clouds of radioactive iodine had delivered intense doses to the town’s children. GELLERMAN: Why did they wait 36 hours before they evacuated? SHEVCHENKO: They waited for the order from Kremlin. They knew about the danger, but they waited for the instructions. I think it is forever – it shouldn’t be forgotten. GELLERMAN: We’re standing at Ground Zero. Today, what remains of the melted number four reactor is entombed in a massive 24-storey sarcophagus. But even 300,000 tons of steel and concrete can’t contain the intense radiation within. GELLERMAN: The levels on our Geiger counter double when we pointed at the sarcophagus – it’s the most radioactive building on the planet. The amount of radiation released at Chernobyl was 250 times that of the atomic bombs dropped on Hiroshima and Nagasaki combined. After a minute here, Alexander wants to leave this place. SHEVCHEKOV: We better get to the car. SHEVCHEKOV: Because it’s rather high. You know, I’ve been inside the sarcophagus four times. GELLERMAN: What is it like? What does it look like inside? SHEVCHEKOV: Wrecks. Ruins. Ruins, wrecks, and high levels of radiation. Only two minutes allowed. GELLERMAN: Shovelful by shovelful, the liquidators removed the radioactive debris and erected the sarcophagus. DODD: What they did was heroic, you know, and I shudder at the thought of anybody ever having to work like that again. Many of these people – and you’ve seen them in the videos – went up on the roof of the Turbine Generator Hall and were basically given instructions to run out into the hall to pick up a piece of fuel or radioactive graphite, carry it 30 or 40 meters, and throw it over the wall. Oftentimes, they were limited to 10 or 15 seconds to do that – once they did that, they basically had taken a lifetime of radiation and they went back home. 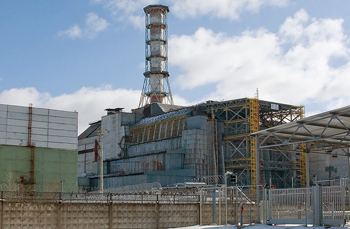 GELLERMAN: But here we are – 25 years out from Chernobyl – and many people have forgotten it, and you don’t have enough money to complete your work, at least right now, and yet we’re betting on future, future, future generations to deal with this. DODD: That’s right. I mean, this is a consequence of Chernobyl, and certainly for the 100-years lifetime of the New Safe Confinement, there’s going to be…it’s going to employ the children and the grandchildren of some of the current workers of the Chernobyl site. MYCIO: The first time I went there, I was absolutely stunned to find out that it was, first of all, not this big giant dead parking lot that I’d imagined – it was really green. And that – when you get out into the wild, it’s actually…there are parts of it that are very, very beautiful. You have the wetlands and peat lands. In one single day, I saw a herd of red deer, a herd of about 40 boars, four moose, and wolf. In the absence of human activity, it becomes a very inviting environment for wildlife. MYCIO: Well they can’t tell. Radioactivity’s invisible. GELLERMAN: But isn’t that the point? You can’t see the radiation, yet there’s been this terrible disaster there. Can’t you tell that radiation has its biological effect? MYCIO: Well I guess you could if you did large animal studies and had, you know, random samples or comparative studies, but nobody is doing that. And…I mean, yes, you can study mice because all you would theoretically need is a couple of mouse traps and some cheese and you’ll get your sample of mice. If you want to study, let’s say, moose, you have to do some big game hunting and it takes awhile – it’s not like they show up on command. So nobody has been providing that kind of funding right now. MYCIO: No, no, nothing like that. If there are mutations being born in the wild, they die – they get eaten by scavengers so nobody actually finds them. Nobody has identified any mutations except for these studies done on swallows where they have some…they had pigmentation damage, like albino spots on their faces. GELLERMAN: What about the forests and the flora, the trees? Have they been affected? Can you see mutations in them? MYCIO: Well there are places where you can see – it’s called radiomorphism, which is radioactivity affecting the orientation that the plant has and the way that it grows. So in very, very radioactive areas, you will have these kind of stunted pine trees that look more like bushes. GELLERMAN: So now we have this largely abandoned area – when do you think people will be able to come back? MYCIO: Oh, it depends. There are parts of the zone where people could actually live now because the lines were drawn in a very, very rough way. Other parts – the parts that are closest to the reactor – as a practical matter, never. They won’t be able to come back. Because plutonium – you have plutonium there and that’s got a half-life of 24,000 years. So unless they figure out a way to clean it up, or…I don’t know if there’s an ‘or’ to that. (Laughs). I can’t see how people could come back there in a safe way. GELLERMAN: When I was in the zone around Chernobyl 15 years ago, I interviewed an old couple who moved back into the zone, and they’re not alone – there are a bunch of people who have moved back. 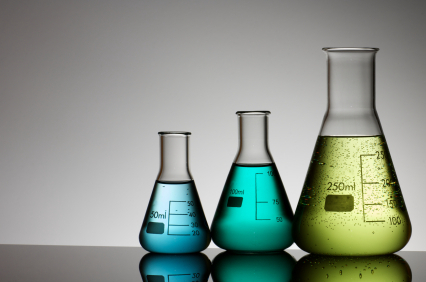 Have we seen any changes in them – any biological effects? MYCIO: Well the irony is that a lot of the people who went back – they’re doing better than people of their own age who were evacuated because the impact of radiation takes so many decades to show up that if you’re an older person, you’ll die of something else before the radiation will kill you. And the people who were evacuated, let’s say, from these beautiful – really truly beautiful, lush wetlands – into, let’s say, the suburbs of Kiev in a high-rise apartment building…that’s a traumatic thing, and a lot of the older people had a very, very difficult time adjusting. While the people who went back – they were sort of in their old houses and, yes, there’s radiation around, but a lot of them prefer to be home. Though I would also caution that a lot of the people who live in the zone aren’t there because they have happy stories to tell. GELLERMAN: One of the, if not the saddest photo I think you’ve taken and the one that kind of has burned an image in my mind, is the one of a farmer and he’s got a tattoo of his wife on his shoulder. ROTHBART: So his full name is Vassily Olessandrovich. I was walking through the town of Ivankiv and I heard him half-drunk, crying in his front yard, and I peeked over his fence and I thought, ‘he’s never going to let me photograph him.’ But I screwed up my courage to knock on the door and ask, and he let me in and talked to me, and we just talked for a few minutes. And he has this tattoo of a woman – I asked him about it. And he told me that his wife had died the previous year from cancer – she died of liver cancer after a long illness. And so after she died, he tattooed her picture on his shoulder as a personal memorial. And while I was working on this new exhibit, I had my assistant Kiev do some fact-checking and she found out that Vassily has now also died. He died last year of stomach cancer, and he was 57. GELLERMAN: You photographed a Chernobyl engineer who had worked at the plant for 24 years – I’m looking at the picture of Viktor. 25 years after the Chernobyl nuclear disaster, residents of the area are still exposed to the radiation. 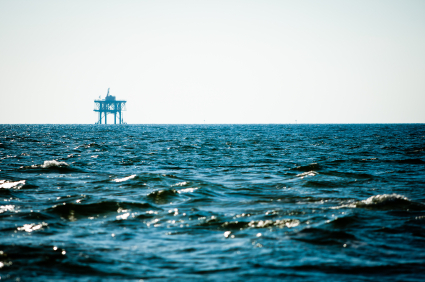 With everything Big Oil and the government have learned in the year since the Gulf of Mexico disaster, could it happen again? Absolutely, according to an Associated Press examination of the industry and interviews with experts on the perils of deep-sea drilling. The government has given the OK for oil exploration in treacherously deep waters to resume, saying it is confident such drilling can be done safely. The industry has given similar assurances. 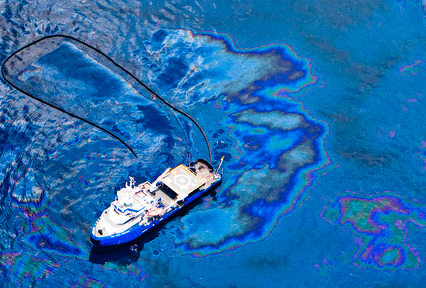 But there are still serious questions in some quarters about whether the lessons of the BP oil spill have been applied. The worst offshore oil spill in U.S. history began with an explosion April 20, 2010, that killed 11 workers aboard the Deepwater Horizon rig. 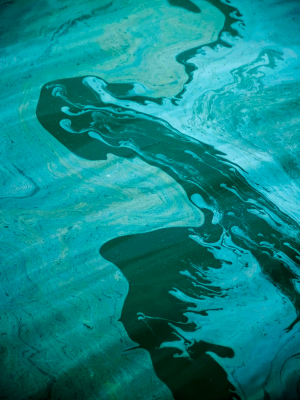 More than 200 million gallons of crude spewed from the well a mile beneath the sea. Since then, new drilling rules have been imposed, a high-tech system for capping a blown-out well and containing the oil has been built, and regulators have taken steps to ramp up oversight of the industry. 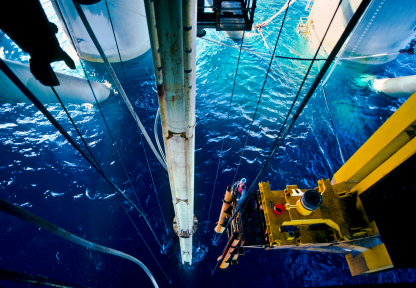 But deep-sea drilling remains highly risky. The effectiveness of the much-touted containment system is being questioned because it hasn’t been tested on the sea floor. A design flaw in the blowout preventers widely used across the industry has been identified but not corrected. And regulators are allowing companies to obtain drilling permits before approving their updated oil-spill response plans. 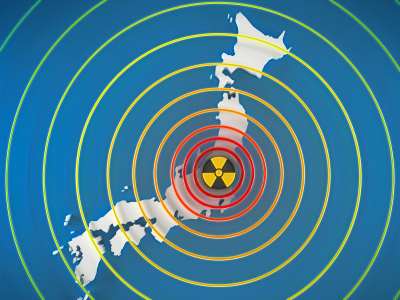 As the immediate threat from Fukushima Daiichi’s damaged nuclear reactors recedes, engineers and scientists are facing up to a clean-up process that could last for many decades, or even a century. Experts on previous nuclear accidents say that the sheer quantity of nuclear material that needs to be removed from the site, together with the extent of the damage, makes Fukushima a unique challenge. The plant’s damaged reactors are home to just under 1,000 tonnes of nuclear fuel and thousands of tonnes of radioactive water (see graphic). Last week, the Toshiba Corporation floated a rough proposal to clean up the site in a decade. But veterans of clean-up operations at sites such as Three Mile Island in Pennsylvania say that it will probably take much longer. The removal of the radioactive material will require a carefully planned and technologically sophisticated programme, made all the more challenging by the devastation left after partial core meltdowns and explosions. No clean-up can begin until the reactors are stabilized. Radiation around the plant is beginning to wane, but the threat of further releases has not yet passed. On 7 and 11 April, severe aftershocks struck nearby, raising fears that the three crippled reactors could be damaged further. The Tokyo Electric Power Company (TEPCO), which manages the plant, says that no additional damage has been detected. A compelling new documentary exploring the noticeably under-reported issue of the environmental impacts of war. Confronts the immensely broad ecological ramifications of everything from technological development and natural resource exhaustion to weapons testing and modern warfare itself. Falling water tables, shrinking forest cover, declining species diversity – all presage ecosystems in distress. These trends are now widely acknowledged as emanating from forces of humanitys own making: massive population increases, unsustainable demands on natural resources, species loss, and ruinous environmental practices. Ironically however, war, that most destructive of human behaviors, is commonly bypassed. In all its stages, from the production of weapons through combat to cleanup and restoration, war is comprised of elements that pollute land, air, and water, destroy biodiversity and entire ecosystems, and drain our limited natural resources. Yet the environmental damage occasioned even by preparation for war, not to mention war itself, is routinely underestimated, underreported, and even ignored. This outstanding, timely, new film explores the crucial need for public scrutiny of the ecological impact of war and reminds us of the importance of accountability and sustainability not in spite of global conflict, but because of it.